Working in close collaboration with Brownline Bv, SlimDril offers The DrillGuide GST, an optical gyro tool that does not require any surface wire grids and is not affected by any external magnetic interference. The DrillGuide GST does not require a non-magnetic drill collar, is positioned nearer to the drill bit, and transmits accurate hole data continuously. Accuracy of the GST tool is 0.04° of azimuth and 0.02° of inclination. Horizontal directional drilling (HDD) has changed dramatically, clients are more demanding, conditions are more complex, and underground infrastructure encountered is more dense. These factors demand a professional approach, the employment of sophisticated tools and techniques, and a trouble free completion of every project to ensure a positive result for the contractor and customer. Magnetic steering tools have been the standard guidance system utilized in the past and will remain an acceptable tool for many jobs in future. However, there are drawbacks, the major ones being its sensitivity to magnetic disturbance and inaccessibility to areas above a drill path. These contribute to a wide accuracy tolerance of the drilled trajectory compared to the desired trajectory. The DrillGuide Gyro Steering Tool (GST) eliminates these problems and achieves greater accuracy. Its use of gyroscopes makes it completely independent of the need to sense magnetic North and it's insensitive to any and all magnetic disturbances. The advantages are a reliable system able to perform under virtually all conditions. The system is resilient to vibration and field results shows that pilot drilling performed with a DrillGuide GST is completed much sooner than with previous systems. The DrillGuide GST is not effected by external magnetic interference, railways, bridges, pipelines (with or without cathodic protection) and high voltage cables are no longer disruptive elements. Also, moving traffic, whether by road, rail or river, poses no problem. 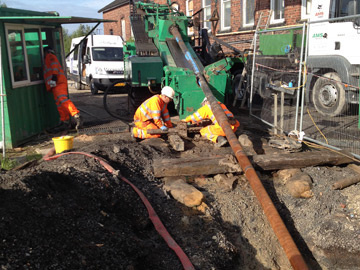 DrillGuide GST brings into play new opportunities where the below ground infrastructure calls for a specific route, for example, to avoid pipes, sewers or foundations. DrillGuide GST is perfect for projects, such as parallel-drills involving multiple parallel routes that must maintain a fixed distance apart. DrillGuide does not require a known magnetic field above the drill-path, this saves time, money and makes possible new drilling opportunities. 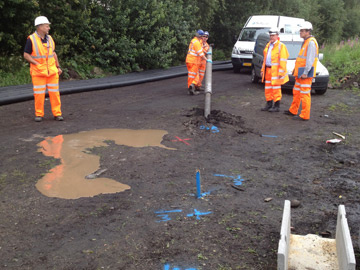 Projects under lakes, rivers, roads, or environmentally sensitive areas can be undertaken with confidence it can be accurately and efficiently carried out. 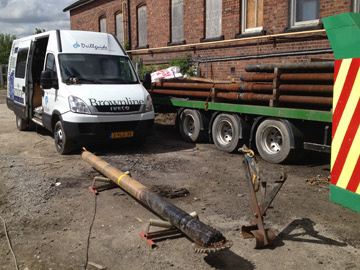 DrillGuide GST updates the location of the drill-head continuously during drilling. Accurate x, y and z co-ordinates of the drill head information is provided in real time, so the driller promptly knows exactly what is required. Not only is the ‘seen’ exit point exactly where it is expected, you also have the assurance that the entire pilot hole route is being drilled as planned. DrillGuide GST does not need to be housed in a non-magnetic environment, doing away with the need for expensive non-magnetic collars. The DrillGuide GST has no restriction on drill-depth and works on the principle of continuous measurement while drilling (CMWD). Measuring the location of the drill head can also be achieved when the drill head is rotating, as the DrillGuide GST does not require a stationary drill head to take readings. The Drillguide Gyro also offer the contractor the ability to monitor the downhole mud pressure while drilling the pilot, which helps prevent Breakout/frac outs causing downtime and potential problems on site. The Drillguide gyro can be used in all rock types from soft formations right through to Hard rock mud motor projects.